Real fighters need a real pair of boxing gloves and today we are going to tell you exactly what that is. There are several things that make boxing gloves good, but we are not looking for good we want the best and I’m going to tell you how you can get it. Firstly we will start with size. Depending on how you are training or what you are training for this will be different for everyone. And for this reason, you need variety. That is why Boxing gloves come in so many different sizes or ounces. Once you have figured out how you will be training you can then look for the right gloves. If you are working on speed then you may opt for a lighter weight such as 12oz. Sparing will normally involve using heavier gloves such as 16oz. And women may want to use lighter gloves like 8oz and 10oz for classes such as boxercise. It all depends on what you doing and personal preference. You want to make sure your gloves fit your needs in order to get the best out of your training. One of the most important things many beginners overlook is the fit of their gloves. If you are only small with hands to match then you may struggle with a large pair of 16oz. And if the gloves are too big for you then you won’t be getting the right support and may injure yourself. One important thing to take into consideration is how your gloves fit with your handwraps on. If you would like to know why this is important then take a look at our handwraps blog which you can find here. There are lots of great gloves out there on the market but none come close to the protection of Hayabusa’s T3 gloves. They come with a patented dual wrist support strap. Which means if you want to get the maximum wrist support possible, you have to go to them. As they have trademarked this design no one else can copy it but that hasn’t stopped some from trying. As you can see above, there are two straps that overlap which allows you to punch harder without worrying about injury. Some have tried to replicate this, like RDX, and made a design where the strap goes around the glove twice but it just doesn’t compare and provides inferior support. If you want a pair of gloves that will last then you need to make sure you buy ones made from the right materials. Some cheaper gloves are made from Pvc or Semi Leather like Venum’s new range of gloves. 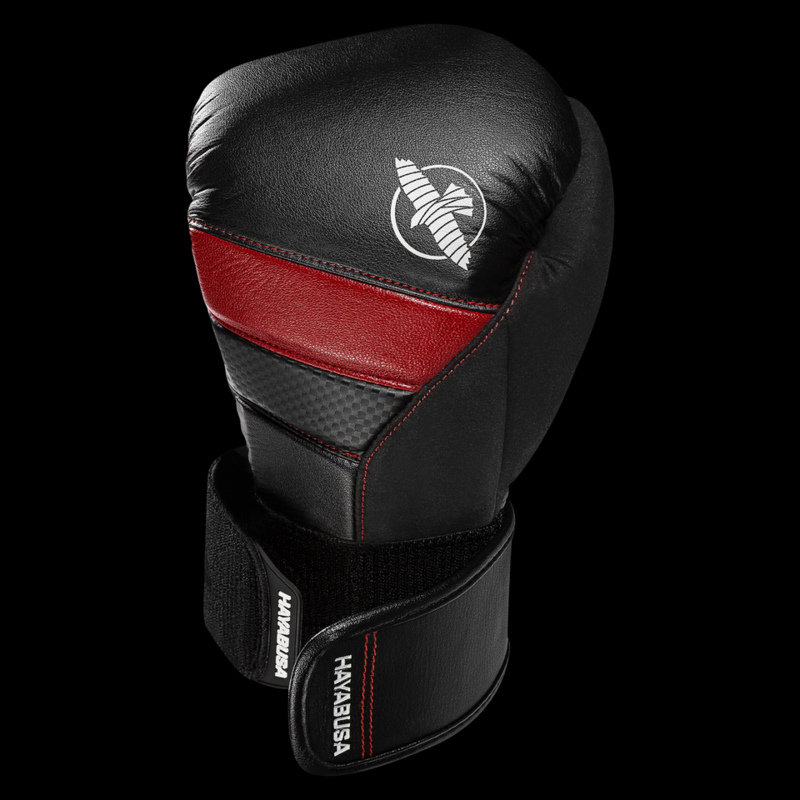 Then there’s the Kanpeki Boxing Gloves which are made with 100% premium full-grain leather. These gloves don’t just look the part but feel and even smell great too. You get that new car smell every time you pull them out of their canvas bag. If you would like to find out more about these gloves and maybe even try then for yourself then click here. Boxing gloves aren’t normally known for their extra features but sometimes a product enters the market and redefines this notion. Hayabusa’s gloves seem to have it all though. They have developed a 4-way splint system that overlaps specifically designed to keep your hand straight while punching. This protects you from injury which in turn allows you to hit harder. The cream of the crop, however, is the Sweat X thumb. Long gone are the days where you have to grab a towel to wipe down your face after each round. Hayabusa has designed a simple yet elegant way to wipe the sweat away during training. You don’t even have to stop what you are doing while still being able to protect yourself. I’ll be honest, these are not the cheapest gloves out there but no one said the best gloves in the world would come without a price tag. Hayabusa has been at the forefront of developing new technology for martial arts athletes. Keeping you safe while training and improving your performance for years. And while I could write all day about how these gloves will protect you and improve your training there is really only one way to truly find out. And that’s to try them for yourself. Or at least take a look here to find out some more information about them. If the price tag is a deal breaker for you but you have always loved Hayabusa products then why not take a look at the S4 gloves here. They won’t give you all the benefits of the T3 range but they do come with some free handwraps and a wash bag. For just £40 you won’t find a better deal anywhere else.